This has become one of my favourite subjects for embroidery since I was first told about it some years ago. It is an example of a similarity tiling. They make lovely patterns for any type of embroidery. 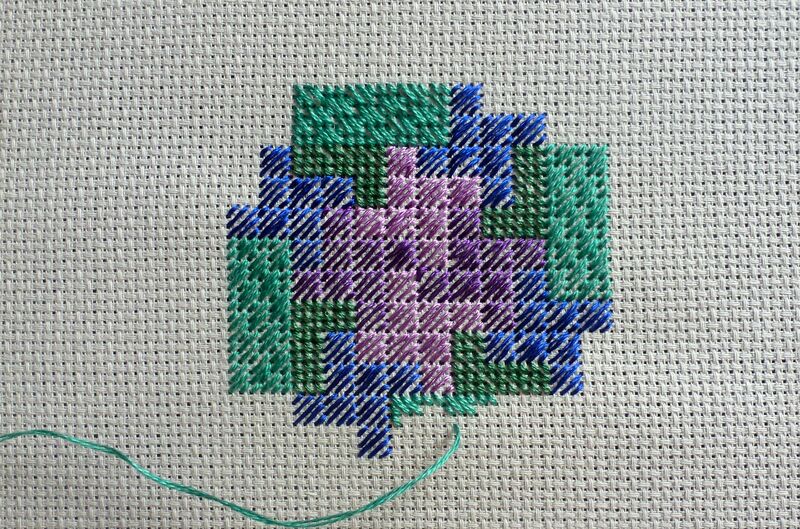 I usually use a cushion stitch as squares are probably the basis of most tilings. This time though I wanted to experiment a bit and decided to use a different stitch. Lozenge stitch was the one chosen and it results in a very unusual octomino. The lozenge stitch makes an elongated rhombus, which results in a very elongated octomino. There are eight octominos in the complete composition. To highlight them I have used two different threads. One is a bright single strand red in silk from the Debbie Bliss range. Made in Romania the threads are primarily for knitting, but I love the soft feel of them and use them sparingly in my embroidery. The other is a variegated pima cotton from the Caron Watercolours range. I chose Tequila Sunrise to go with the red. The fabric is a 16 count Aida in white. The work is fairly easy and the stitching was completed in just under five hours. Using quite thick threads means the surface has as raised look to it. I have temporarily put the finished piece in an oval hoop. It is a woodgrain flexi hoop and I found it almost impossible to get the finished work to fit into the hoop. I did succeed, but the piece is not centred. Not sure how one is meant to achieve this. Anyway it looks OK, so I will leave it around for a few days before deciding what to do. I like the oval shape, but it is a bit too awkward to use, so not sure if I will buy any more. My second go at fabric postcards is now complete. You can see my first attempts here. This time I went for something in Blackwork. Though as you will see there is no black to be seen. The fabric is a 28ct Brittney mix of cotton and rayon in pine green. For the stitching I used silk threads. Here is the completed postcard. The composition features two of Brigid’s octominos. As I was going to use Blackwork patterns for the octominos, I decided I needed to outline each of the octominos. For this I choose a silver green thread from au ver à soie. I used one strand of the silk thread for a whipped backstitch outline. This proved much harder than expected and the hardest and most difficult part of the whole project. Partly due to the fineness of the fabric, but mainly because the silver green thread was very similar to the colour of the fabric. This was deliberate on my part, as I did not want the outline to dominate. But it did make the stitching very hard. Each octomino is stitched with two Blackwork patterns and I used two different threads to emphasise each pattern. One was stitched with two strands of au ver à soie silk in red carnation. The other pattern was stitched with four strands of Glisten Colorwash silk in Flame. These patterns did require a bit of patience and concentration, but were easier than the outlines. The finished piece has now been assembled and is on its way to Winterthur in Switzerland. If you fancy entering a postcard in this event, here is the website. Happy stitching! Last Saturday I was down in Peebles for the opening of a new exhibition. The exhibition is entitled Wandering Threads and is to showcase work by members of the Embroiderers Guild in Scotland. In this case it is not only the threads that wander, but the exhibition itself, which tours Scotland between now and November. The show covers all kinds of textile art and I am pleased to say that I have three pieces on display. I was particularly excited about this, as it is the first time that I have submitted work for selection, and all three pieces were selected. Peebles is a lovely douce Borders town, and with the Borders one of the historic centres of textiles in Scotland, a suitable choice for hosting the opening. The exhibition was officially opened by Andrew Crummy, the artist who drew all the panels for the Great Tapestry of Scotland. It was good to meet up with Andrew again, who seems to be still busy with tapestry projects. If you fancy visiting the exhibition then here are the details of the venues and times. My most recent embroidery project was another foray into the world of fractals. Brigid’s Octomino is probably the easiest to work in embroidery, as it is also a similarity tiling. Basically this means that eight octominos can combine to form a bigger octomino which in turn combine to make an even bigger octomino. The process can go on indefinitely, though you do end up with an awful lot of octominos. I limit myself to 64 of them. I did my first one way back in 2011 and this time I doubled the size of each square and limited myself to two colours – pinks and greens. to highlight each octomino I used two shades of pink and green. Here it is. The fabric is a 16t Aida in black and I used three strands of DMC cotton. Each square is in cushion stitch. Each octomino stands out quite clearly and the overall shape is one big octomino. For my current project I have returned to blackwork, though once again, not in black. A rather bright fuchsia in silk. So far it is a pretty dense set of patterns. Happy stitching. After a brief gap while on holiday in Copenhagen, I am back stitching again. Before I went on holiday I managed to finish the project I was working on. Unusually for me, this was a repeat of a design I had worked on years before. In fact it was one of my first stitching projects. 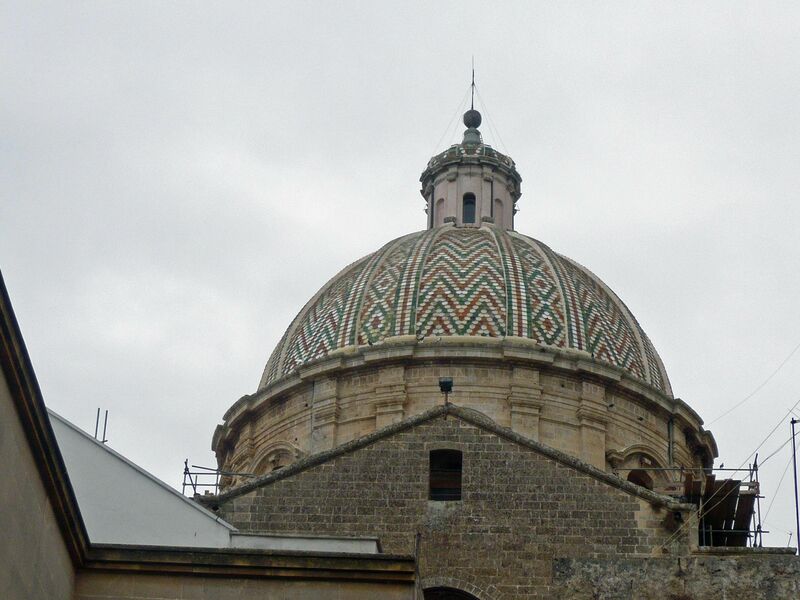 The design is based on the tiling on the dome of the Madre Chiesa in Francavilla in Puglia in southern Italy. It is the hometown of Alessio’s Italian granny and we were there on holiday for Alessio’s second birthday. I liked the pattern on the dome so much that I used it to develop a design for stitching. The stitches are either simple verticals or horizontals. 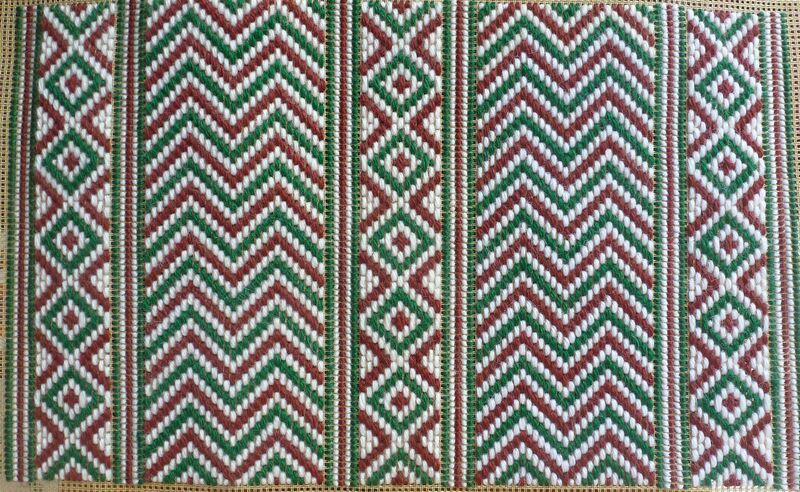 So it is a kind of Bargello pattern. I have now repeated the piece, this time as a present for Pompeia, Alessio’s nonna, who of course now lives in Switzerland. The piece was stitched in a Penelope type canvass with Anchor tapestry wool in white, emerald green and damask rose. Below is a photo of the dome and then the stitched piece. I will now get it framed before taking it out to Switzerland in September. I am now working on a new project. This one will be a bit of a make it up as you go piece. Though the centre is Brigid’s octomino. This is an example of a fractal, a mystery of the mathematical world. This particular fractal is a repeating tessellation with an octomino – made up of 8 squares – as the basic shape. Quite why it is called Brigid’s octomino is itself a bit a mystery. There are 8 octominos in the design and the overall shape is itself an octomino. Here is what it looks like just now. You can just make out the octomino which is stitched in two shades of purple and in a royal blue on the outside. The fabric is an 18ct Aida and the octomino was stitched with three strands of Rajmahal ArtSilk threads. The rest of the design will be stitched with two strands of DMC cotton. Greens will be the prominent colour here, with a little purple and blue for a bit of variety. At the moment the rest of the piece is a bit of a mystery. Wish me luck.